Figure 430. Console Emulator module. When recording to analog tape, the mixing console is the centerpiece of the studio. The audio signal is affected as it passes through the circuitry of the console. Each console employs a different design and components, which adds to the sonic imprint of each console. There are various elements that define the sound of each console. Digital audio is often accused of lacking “character”. Although mixing entirely inside a computer (often referred to as “mixing in the box”) has many benefits, it can sometimes lack the character of using an analog mixing console. The Console Emulator module emulates the sonic characteristics of three classic mixing consoles. This has nothing to do with EQ and compression, but rather mimics the subtle non-linear distortion and noise that occurs when passing an audio signal through a mixing console’s analog circuit. Input transformer emulation, which introduces hysteresis and frequency dependent saturation. Frequency response shaping of the channel. Bias drift of the active stages. Component tolerance simulation by slightly changing the filter's values in the different channels. Saturation of the mix bus. Increased sense of spatial cohesion. A bit more warmth and aggression. Easier to balance levels across tracks. Console Emulator Channel. This version is designed for individual tracks. Console Emulator Bus. This version is designed for buses. It contains the same controls as the Channel version, except it does not have a Trim control. Figure 431. Console Emulator Channel and Bus modules. Mode. Selects the desired console emulation mode. For each mode, the Console Emulator module closely resembles the hardware it is modeled after. S-Type. Emulates a clean and transparent British console that is popular among mixing engineers in rock and pop genres. This console has potentially been used on more platinum selling albums than all other consoles combined. N-Type. Emulates a British console that is used in legendary recording studios, including Abbey Road, The Village, Ocean Way, and Skywalker Sound. This console is warm and has a rich low end. A-Type. Emulates a revolutionary British console, of which only 13 consoles were ever built. This console was made famous at Trident Studios and Cherokee Studios. This console has a brighter top and less lows than the N-Type console. Some consider this best sounding console of all time. Clipping LED. Shows if the input signal to the Console Emulator module is clipping. If there is any distortion in the ProChannel signal chain, the clipping LEDs let you identify where the clipping occurs. Console Emulator enable/disable . Enables/disables the Console Emulator module. Output VU meters. These meters are calibrated to function responsively, just like real-world meters. These meters fully support proper gain-staging needed for professional mixing situations and let the user make a better judgment of the volume needed for a particular track. RMS/Peak. The VU meters can be switched to show RMS or Peak levels. Choose RMS to display more of an average of the amplitudes that occur in a complete cycle of a frequency. RMS, or Root-Mean-Square, is a little over seventy percent of peak level. Choose Peak to display the highest amplitude in the signal that occurs in a complete cycle of a frequency. Trim. Adjusts the input gain. The valid range is 0% to 100% and the default setting is 0%. This control is only available in the Console Emulator Channel module, not in the Console Emulator Bus module. Hold down the SHIFT key to adjust the control with finer resolution. Drive. Adjusts how much of the pre-processed input signal enters into saturation. For example, in an analog hardware mixer, if you put all the channel faders at +3 dB, the summing circuits will saturate more than if the channels faders are set to 0 dB. With this parameter, you can control the amount of summing saturation. The valid range is -6.0 dB to +6.0 dB and the default setting is 0 dB. Hold down the SHIFT key to adjust the control with finer resolution. Note: The Drive parameter faithfully emulates the behavior of a fader on a real hardware console when the Drive value is between -6 dB and +2 dB. The Drive range is extended and goes beyond its hardware counterpart, allowing creative processing when the value is between +2 dB and +6 dB. Tolerance. Simulates the component tolerances of the bus circuits. Even if all the channels in a mixer are in theory equal to each other as they are composed by the same electrical components, in practice these components can be slightly different among the channels. For example, a 2Kohm resistor could be 1.98Kohm on channel 1, 2.03Kohm on channel 2 and 1.99Kohm on channel 3, and so on. 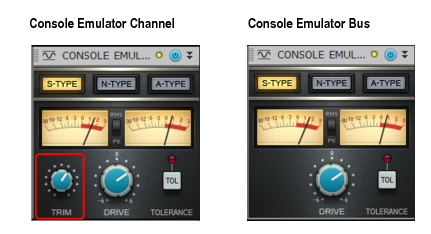 By enabling the Tolerance switch, the Console Emulator module will sound slightly different on different channels. These differences are saved into the song state, so it can be recalled when you reload the session. To get the full benefit of console emulation, you typically want to add the Console Emulator module to all audio tracks and buses across your project. The audible results may appear subtle when first using the Console Emulator module. In fact, you may not hear any difference at all at first. This is especially true if you insert the Console Emulator module after you have already mixed a song. The effect is subtle when listening to individual tracks or buses. Keep in mind that the effect is accumulative, so the effect will become more noticeable as you add Console Emulator to multiple tracks. The trick is to insert the Console Emulator module before you start mixing. All your mixing decisions will then be made based on having the Console Emulator module in the signal chain. When you are done mixing, you can globally enable/disable the Console Emulator module to A/B the results, and you will likely hear a noticeable difference. You will typically want to insert the Console Emulator module as the first module, and make sure ProChannel has Post FX Rack disabled. However, you can also experiment with placing the Console Emulator module at the end and enable Post FX Rack, so all your effects and processed sound are affected. Add the Console Emulator module to all audio tracks and buses across your project, and use Quick Groups to easily control multiple instances simultaneously. To do so, select all tracks, then hold down the CTRL key while you insert or modify the Console Emulator module. Leave the Console Emulator module active throughout the mixing process, “working” the mix through the plug-in. Tip: Add the Console Emulator module to the default ProChannel layout. This way, the Console Emulator module is always available on all tracks. Use the same console mode on all tracks and buses.